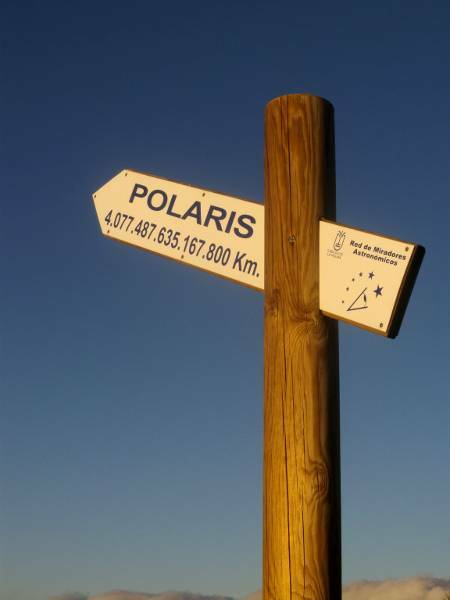 Actually, Polaris is one of the closer stars. La Palma’s island government is creating a network of astronomical viewpoints. Each has parking space, level ground suitable for tripods, a signpost pointing to the pole star, and an information panel. So far there are only two, at Llano de la Venta and Llano de los Jables, both generally above the clouds at 1,300 m altitude on either side of the island’s central ridge. They are easily reached using the LP 203, the minor road over the ridge from Santa Cruz de la Palma to El Paso. Llano de la Venta is on the Eastern side of the island, in Breña Alta and is surrounded by lush vegetation, while Llano de los Jables is on the west, in El Paso, and surrounded by black, volcanic ash from an eruption in 1949. Five more astronomical viewpoints are planned for 2011, and they have great plans for the exhibits in these open air museums. Update: The viewpoint at La Muralla in Tijarafe is now open. Update Feb 2012: the viewpoint at Las Toscas in Mazo is open.